In their sin and disobedience, Jerusalem became shameful because it was not bearing fruit for God. They openly rejected His ways and teachings. So God, in His righteous anger, decided to punish His people for disobeying. However, in today’s reading, God promises that when they return to Him, He will gladly take them back. He will bless them with abundance they have never known. They will no longer have to suffer through the shame and disgrace brought on by their disobedience. “Fear not; you will no longer live in shame. Don’t be afraid; there is no more disgrace for you. You will no longer remember the shame of your youth and the sorrows of widowhood.” (54:4, NLT). He makes a promise to them that will last forever, just like He made with Noah. “Just as I swore in the time of Noah that I would never again let a flood cover the earth, so now I swear that I will never again be angry and punish you. For the mountains may move and the hills disappear, but even then my faithful love for you will remain. My covenant of blessing will never be broken.” (54:9-10, NLT). No enemy will ever overcome them, so long as they remain faithful to God’s way of life. “Is anyone thirsty? Come and drink — even if you have no money! Come, take your choice of wine or mink — it’s all free!” (55:1, NLT). God offered the Israelites a gift that they would not have to pay for, they simply needed obedience. He tells them to feed off of Him. Physical food would only feed their bodies, but they need more that simply eating bread and meat. They need God’s word to live off of as well. He knows that unless they seek after Him, just like they will seek after food everyday, the Israelites will have problems keeping their end of the covenant God wishes to renew with them. He tells them that His word produces fruit, and it will prosper where ever He sends it. He wishes to give it to the Israelites so they can become fruitful again. He reminds them that they cannot understand His mind. “For just as the heavens are higher than the earth, so my ways are higher than your ways and my thoughts higher than your thoughts.” (55:9, NLT). Men cannot understand all that God knows and thinks. Our minds are small and feeble in comparison to His. There are times where God calls His people to do things they don’t understand. He reminds them that the proper way to behave is in obedience to Him. God shows His people how obedience to Him gives greater glory and blessing than following the will of man ever will. God picks two classes of people in Israel to speak directly about, eunuchs and Gentiles. He says that so long as they obey God, He will give them blessings beyond anything they could receive by man. “Don’t let the foreigners who commit themselves to the Lord say, ‘The Lord will never let me be part of his people.’ And don’t let the eunuchs say, ‘I’m a dried-up tree with no children and no future. '” (56:3, NLT). God is not going to allow people who truly seek after Him live with the shame that these people groups have to live with. “I will bless those eunuchs who keep my Sabbath days holy and who choose to do what pleases me and commit their lives to me.” (56:4, NLT), “I will also bless the foreigners who commit themselves to the Lord, who serve him and love his name, who worship him and do not desecrate the Sabbath day of rest, and who hold fast to my covenant.” (56:6, NLT). “For the Sovereign Lord, who brings back the outcasts of Israel, says: I will bring others, too, besides my people of Israel (56:8, NLT). Just like in the days of Isaiah’s writing, God cares for His people today. He wants to bless us, and see us prosper. He doesn’t want to see us harmed, or have to suffer. Yet we constantly choose to disobey Him and have to live with the consequences of that decision. In order for us to have better in our lives, we have to seek God first. Whether that means for you, the first thing you do in the morning is study the Bible, or you have to go find one of those WWJD bracelets for a constant reminder. The point is that God has to be our first priority. While Jesus was being tempted in the wilderness after his baptism, he became hungry. The devil tried to convince him to turn a rock into bread so that way he could eat and be filled. But Jesus knew better. He turned and quoted Deuteronomy to the devil, “Man shall not live on bread alone, but on every word that proceeds out of the mouth of God.” (Matthew 4:4, Deuteronomy 8:3, NASB). We have to realize that we need God more and more. It is not enough to make sure our physical needs get met, and only give God whatever prayer we say before dinner time. We live because God allows it. His word sustains us. We can only grow and hunt whatever food we eat, because God allows that to live. We should seek after Him first. This is the way we align ourselves in a right manner. We cannot be distracted by other directions, because God is our primary objective. Jesus said in his Sermon on the Mount, “But seek first His kingdom and His righteousness, and all these things will be added to you.” (Matthew 6:33, NASB). We won’t have anything to worry about or anything else to need, if the very first thing we look for in our lives is God. After Gods’ promises of salvation and victory in the previous section, God begins to talk about an anointed one to bring forth salvation for all mankind. However, knowing His people the way He does, God knows that people will begin to question His motives or the method that He uses. But God tells His people, “What sorrow awaits those who argue with their Creator. Does a clay pot argue with its maker? Does the clay dispute with the one who shapes it saying, ‘Stop, you’re doing it wrong!’ Does the pot exclaim, ‘How clumsy can you be? '” (45:9, NLT). God uses the fact that He is the Creator as His reasoning for His ability to do as He sees fit. God then speaks on the future conversion of the Gentiles. He says, “I would not have told the people of Israel to seek me if I could not be found. I, the Lord, speak only what is true and declare only what is right.” (45:19b, NLT). Which then leads to the conclusion at the end of the chapter, “The people will declare, ‘The Lord is the source of all my righteousness and strength.’ And all who were angry with him will come to him and be ashamed.” (45:24, NLT). God continues to call out to His people to repent. He does not want to punish these people; they are His and He loves them very much. However, He knows that a time is coming that He will have to unleash His wrath upon them. He makes yet another plea to them saying, “Listen to me, descendant of Jacob, all you who remain in Israel. I have care for you since you were born. Yes, I carried you before you were born. I will be your God throughout your lifetime — until you hair is white with age. I made you, and I will care for you. I will carry you along and save you.” (46:3-4, NLT). He points again to idol worship of the pagans, especially Babylon. These idols cannot save the people who worship them or do anything else for them but stand there and look pretty. But God tells them that He is a living God who is willing to act for them. “Listen to me, you stubborn people who are so far from doing right. For I am ready to set things right, not in the distant future, but right now! I am ready to save Jerusalem and show my glory to Israel.” (46:12-13, NLT). Turning towards the new oppressors, God addresses the Babylonians. They claim that they are the only one, and none are more powerful than they are. Yet God tells them that a great calamity is coming their way, one they are not prepared to handle. The consequence of this is that they will sit in shame before all people. God says to them, “Come down, virgin daughter of Babylon, and sit in the dust. Four your days of sitting on a throne have ended. O daughter of Babylonia, never again will you be the lovely princess, tender and delicate. Take heavy millstones and grind flour. Remove you veil, and strip off your robe. Expose yourself to public view. You will be naked and burned with shame. I will take vengeance against you without pity.” (47:1-3, NLT). Nothing about this image is nice, it is all a place of shame. God seeks to take a once great nation, and bring it down low because it was too prideful and worshiped false gods. He then brings the idol worship back home to the Israelites. God knows that even they are subject to breaking this Commandment.”You don’t keep your promises, even though you call yourself the holy city and talk about depending on the God of Israel.” (48:1-2, NLT). Even Israel is not safe from the condemnation of idol worship. But God offers them a new prophecy to show that He is God and none of the idols can compare to Him. He tells His people that His anointed one will come and destroy Babylon. This act is going to cause the Israelites to be set free, and return home after the Exile. There is a single theme that keeps grabbing me today as I read these passages, idol worship is foolishness. Back during the times of Isaiah’s writing, idol worship was easy to pick out. If someone created a statue and decided to worship it, that was idol worship. Yet, this sin still exists in our world today, it just normally doesn’t come up as a statue anymore. The biggest form we see today is over money. People seek after the “great green George” thinking that all their problems would be solved if they made enough money. I myself have been caught thinking these same thoughts a time or two. Another form of idol worship comes in the form of fame or the famous. We either want to become well-known, see our name in lights, or be some big hot-shot movie star. We can also tend to take a person and follow their every move, know everything about them and their life as if we were actually friends with these people. The list goes on and on over what idol worship looks like to us today. I simply ask that we be mindful of where our gaze gets taken away from the Creator and given towards created things. Many times in these passages God calls the people who worship idols foolish. Do you want to be foolish? Or would you rather stick down a path that leads to wisdom? Proverbs says “The fear of the Lord is the beginning of wisdom, and the knowledge of the Holy One is understanding” (Proverbs 9:10, NASB). We must seek out God and not allow our sights to be taken off of Him. Today’s section starts with a message to Assyria. God tells them that even though they are mighty, and will destroy the Northern Kingdom, they will be destroyed. He goes on to describe that Jerusalem will end up being strong. “I will be like a tent whose ropes are taut and whose stakes are firmly fixed.” (33:20, NLT). “The people of Israel will no longer say, ‘We are sick and helpless,’ for the Lord will forgive their sins.” (33:24, NLT). The Lord then explains His wrath against all the nations of the world. He states that He has problems with every single one of them. Yet He singles out the nation of Edom (the descendants of Jacob’s twin brother, Esau). He promises that the Edomites’ land will be destroyed and become a wasteland. God then delivers a hope for salvation and restoration. He describes the land as becoming lush and abundant. “Yes, there will be an abundance of flowers and singing and joy!” (35:2, NLT). Lastly there will be a road that cuts through the deserted area called the Highway of Holiness. This road can only be found and traveled on by those following God; all others would perish in the wilderness. The “Highway of Holiness” really is another prophecy about God’s redemptive plan. “And a great road will go through that once deserted land. It will be named the Highway of Holiness. Evil-minded people will never travel on it. It will be only for those who walk in God’s ways.” (35:8, NLT). Before Christ, we were all stuck in our sin. There was no way out. I love the phrase that the pastor Louie Giglio has been throwing around, “Sin makes you dead”. Sin is exactly like the deserted land being described in these chapters. Nothing is alive in sin, everything is dead. Yet a pathway has been cut for us to travel through this deserted land and into a living place full of singing and joy. That path was created when Christ died on the Cross. Jesus told his disciples, “I am the way, and the truth, and the life;” (John 14:6). Jesus is telling us that if we want to get through the deserted place and come into life with God, we must travel on the Highway of Holiness. The only way to reach that Highway is through belief in Jesus Christ. Sorry for the unexpected hiatus. My family and I had a very stressful situation with trying to move, I simply didn’t have time to blog. 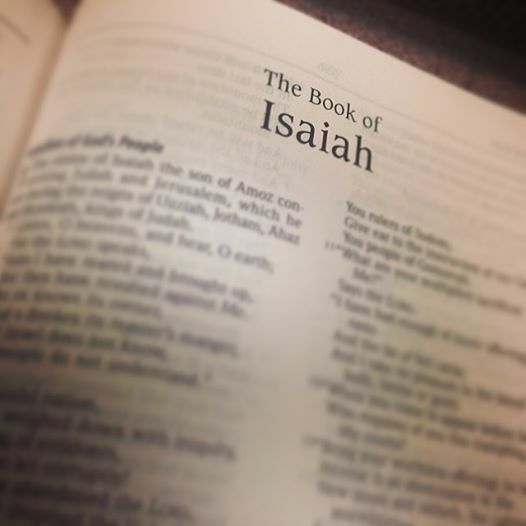 But today I return and we will continue on with the Isaiah study that we started at the end of April. In today’s section, Isaiah opens with a warning aimed at Samaria (the capitol of the northern kingdom). However this message could be applied to the entire northern kingdom of Israel. After King Solomon’s reign, the kingdoms split. One major way the leaders tried to keep the people from going to Jerusalem to worship was by placing idols inside a temple. This tempted Israel into idol worship. He tells them that they will soon be destroyed by foreigners and taught the lessons that God has been trying to teach them by their oppressors. Then God moves to Jerusalem (the capitol of the southern kingdom). He warns them of following in the footsteps of their northern relatives. I particularly denounces worship by going through the motions. “These people say they are mine. They honor me with their lips, but their hearts are far from me. And their worship of me is nothing but man-mad rules learned by rote.” (29:13, NLT). Another version is translated, “Their worship is a farce, for they teach man-made ideas as commands from God.”. He then continues to tell them how worthless it is to rely on other human beings, and not God. Isaiah depicts the coming of God’s anger, but God tells His people, “Only in returning to me and resting in me will you be saved.” (30:15, NLT). Isaiah then goes on to describe what the coming King will bring to the people. “Justice will rule in the wilderness and righteousness in the fertile field. And this righteousness will bring peace. Yes, it will bring quietness and confidence forever.” (32:16-17, NLT). I think that in today’s world, most people are suffering from symptoms of not following God. I even have these problems myself. They come in the form of questioning yourself, God, or others and a general sense of chaos. I heard a sermon a few weeks back. The pastor was talking about hearing God’s voice. He showed a graphic that one side had the characteristics of God’s voice, and the other was the characteristics of the Enemy. On the Enemy’s side were words like, “chaos”, “insecurity”, “instability”. Yet on God’s side were the words “peace”, “security”, “stability”. I think we have too many people running around not listening. Isaiah tells us that when the King comes that His righteousness will bring peace. That Kingdom is upon us my friends. We have to simply reconnect (or connect for the first time) to God, who is our King. When we are in His presence, we feel like we are at home. If you’re in a place where you are feeling uncomfortable, or not sure of yourself, or simply depressed, I promise you that those feelings are not from God. I encourage you to crack open a Bible (not that we aren’t doing that now) and reading one of the Gospels. I’ve had to do this myself recently, while moving made my life a little too chaotic. I promise it works. Our God is a god who bring peace. Remember that.